Make your way to the Northeast Corner of the Michigan Avenue Bridge for your cruise departure. Board your river boat and grab a seat or a drink to start your night. Enjoy a relaxing scenic evening cruise while sipping your cocktail and enjoying the live music on board. Along the scenic 75-minute route, see buildings by world-famous architects including Mies van der Rohe, Helmut Jahn and Skidmore, Owings and Merrill. A boat on the river is the best vantage point to admire the distinct city skyline. Pass by more than 40 distinctive buildings, including the Aon Center, the John Hancock Center, the Willis Tower (formerly known as the Sears Tower) the Wrigley Building and the IBM Building. 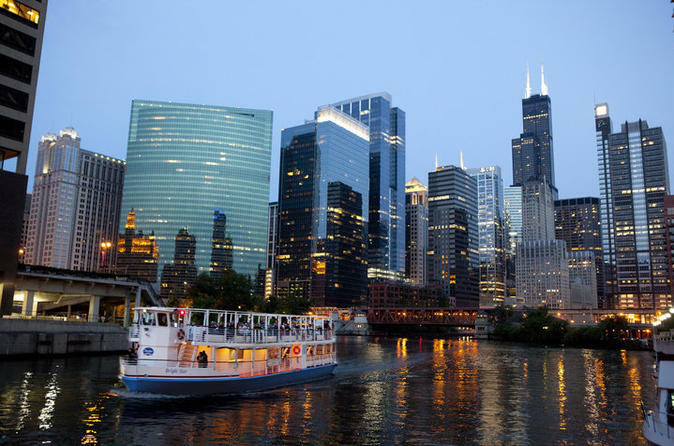 Enjoy a drink with your friends as you sail past the iconic buildings that line the Chicago River and enjoy a nice summer night out on the town.